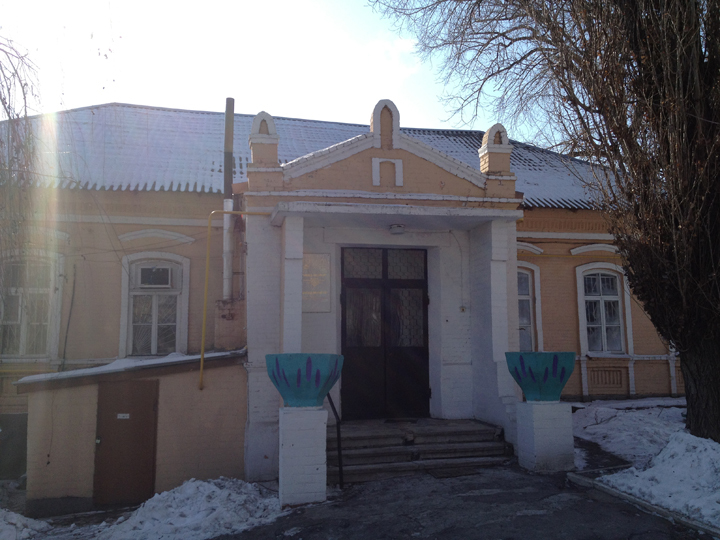 In this blog post, CMJS researchers Liz Tighe, Raquel Magidin de Kramer and Dina Bleckman describe a recent research trip to eastern Ukraine and Moscow. This project is the latest in a series of reports on international comparisons of neediness among elderly Jews in the Former Soviet Union (FSU) conducted by researchers at CMJS. The present work also included an initial review of data on international comparisons of the situation for children at risk in the FSU. Throughout the FSU, the American Jewish Joint Distribution Committee (JDC) has supported the development of Hesed welfare and Jewish community centers to assist in the provision of services to Jews in need and to support the renewal of Jewish life after years of suppression. Raquel, Dina, and I visited Hesed welfare centers in eastern Ukraine and Moscow, Russia in order to gain a better understanding of data collected by the JDC as part of their case management system. As a resource for describing the needs of Jewish elderly and children served by these centers, the Hesed data are unparalleled. 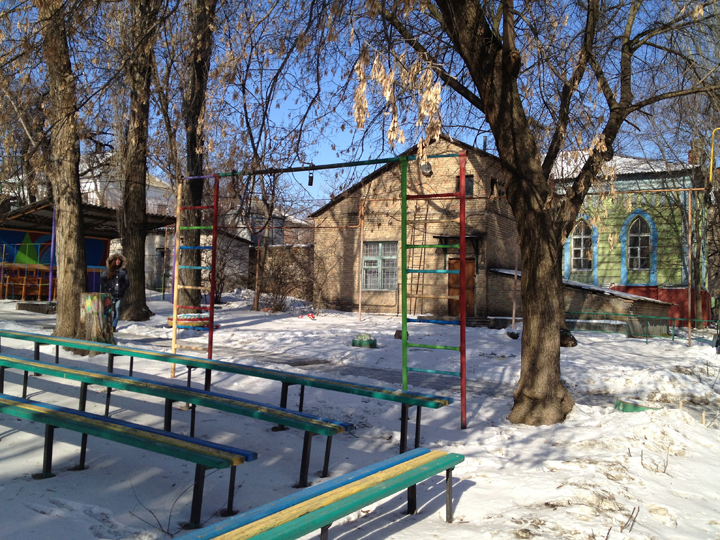 Playground in Melitopol, Ukraine with the old mikveh (ritual bath) in background. The primary goal of the visits was to determine how well the data reflect the nature of the problems experienced by elderly and children in these regions. It was also important to gain a better understanding of how information is interpreted and understood by those in the field who were collecting the data and whether their understanding is reflected in how we interpret the data here in the United States. Given that the nature of community in these regions can vary dramatically from the typical communities we study here in the United States, it was also important for us to get a sense of the complexities of the social context in which these data are collected. Our trip began with a late night arrival to the city of Dnepropetrovsk, Ukraine. Dnepr is the fourth largest city in Ukraine, with a population of around one million. Located on the Dnieper River (which was frozen during our visit! ), the city had been an industrial center for weapons and space industries during the Soviet era and had been a closed city, not appearing on maps and with restrictions on residents for travel outside and for outsiders to enter. In the late 1800s and early 1900s the city was estimated to be nearly 40% Jewish. At the start of World War II, it was estimated fewer than 20% Jewish. Today, the Jewish community is estimated to be around 40,000, less than 5% of the total population in the city. We also visited a smaller city outside of Dnepr, Melitopol. We were so focused on our quest to understand the local data that we were taken by surprise by the generosity and enthusiasm of local community members who had prepared traditional Jewish music and dances to perform for us. We could not resist pulling out an iphone to try to capture some of what was experienced. For Dina, whose family had emigrated from Russia when she was very young, seeing people engaged in Jewish activities in Dnepr and Melitopol had special meaning. From groups of men meeting at the local synagogue in Dnepr on the Tu B’Shvat holiday who invited us to join them for a fig and an Ha-aitz blessing, to the Hebrew classes, dance classes, literature clubs and other activities organized through the community centers, it was a powerful experience to witness such engagement in Jewish life knowing that just 25 years earlier there was nothing. 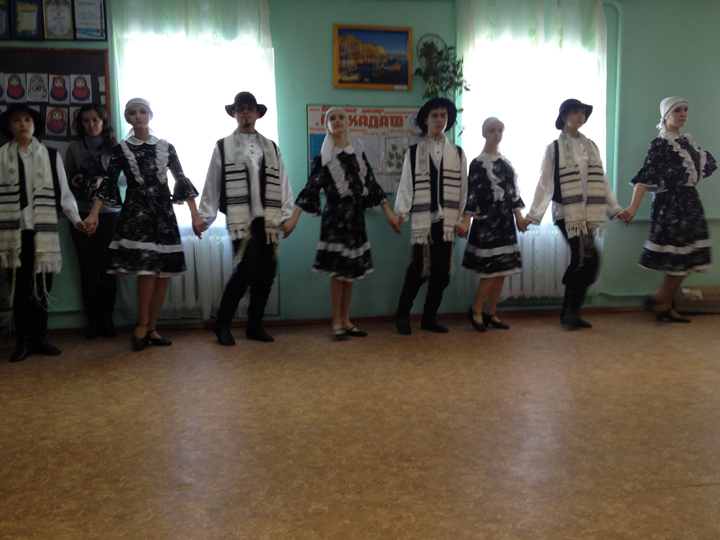 Jewish folk dance group in Melitpol. Raquel, a daughter of a life-long Yiddish teacher, was especially taken by the renewed interest in the Yiddish language and culture. And all of us were impressed by the Tzedakah-o-matic in the lobby of one of the local Hesed centers, which in collaboration with a local banker, enabled users to make anonymous donations electronically. We learned much about the local data and we left with much more, including fond memories of the hospitality of all, particularly the patience and dedication of our translator, Anna, who worked tirelessly to convey our research questions to local staff and community members, and the generosity of the cooks at Hesed Menachem—the kindness in the food that they prepared and shared with us will always be remembered. We also left with fond memories of dumplings, chicken schnitzel, pickled vegetables, sweet farmer’s cheese blintzes, and the best beet salad I have ever had. If anyone can find the recipe from the restaurant in Melitopol I’ll forever be grateful! Our report on the needs of Jewish elderly, which includes some of the Hesed data, can be viewed here, and the short-form research brief here. It might be a bit more difficult to digest than dumplings, but we hope it provides at least a bit of food for thought. Enjoy!